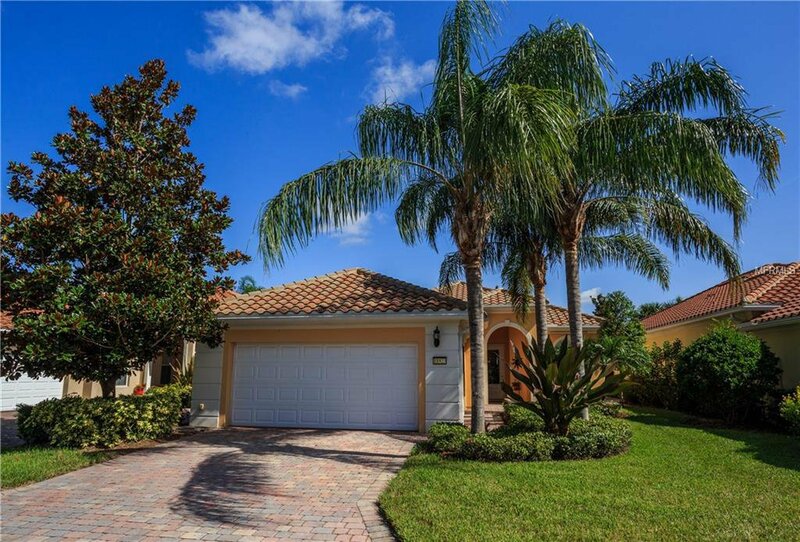 This light & bright, immaculately maintained 3 BR home features high open ceilings and many large windows w/Plantation shutters that let the sun shine in! The spacious living room offers built in shelving and a lovely view of the extended screened patio and serene canal. The den at the entry can also be used as a formal dining room. Nicely equipped, the kitchen features granite tops, 42"cabs, SS appl. & a breakfast bar opening to the living room & dinette area. Extensive tile flows throughout the main living and traffic areas for a sleek clean look. Engineered wood in all other rooms. The unique master bath features 2 separate bathrooms in one area, offering a full 3rd bath for flexibility and space. Split plan so BRs 2&3 are private & share the guest bath w/glass block accent. The laundry room has cabs and a built-in laundry sink. Equipped with hurricane shutters, a security alarm and has a tile roof, all offering you security. You'll love the convenience of the 24hr guard gated community of VillageWalk at Lake Nona! Only minutes to the airport, Nemours, VA clinic & UCF Med School. The Town Center offers a ballroom, activities director, library, card room, computer center, deli, gas station, salon, heated resort-style swimming pool, lap pool, 6 lighted clay tennis courts, state-of-the-art fitness center, basketball courts, miles of biking and walking paths along waterways. HOA fees include exterior lawn maintenance, cable TV, Internet, & monitored in home sec. system. WOW! Call today & don't miss out! Listing courtesy of KIM JAMES REAL ESTATE GROUP. Selling Office: LA ROSA REALTY, LLC.